The first thing that you notice when you take the LN-SB50 out of the box and hold it for the first time is that this is not a piece of equipment to be taken lightly and they are a substantial piece of kit. With their very masculine styling, these Luna Optics night vision binoculars shout out that they are made in Russia and they have been made to last! Weighing 1350g (2.97lb)and with dimensions of 200mm x 153mm x 66mm (7.8"x5.9"x2.6") you are never going to describe these as lightweight or compact, but remember that they do have fairly large 80mm objective lenses to take in as much light as possible. The body looks very well made and has a certain feeling of robustness to it. I guess one of the biggest advantages of the LN-SB50 over many other night vision binoculars that I have used is that you can adjust the distance between the eyepieces (inter-pupillary adjustment) to perfectly suit your face. This is something that is almost taken for granted with standard daytime optics, but is more uncommon for night vision binoculars and for some people can make a real difference. On top of the body and easily reachable whilst holding the binoculars up to your eyes is the On/Off and Infrared illuminator (IR) buttons. In between the eyepieces is the battery compartment that takes 1x3V Lithium (CR123) battery that Luna Optics say gives them an operating time of 36 hours. It is accessed with a twist off cap, that was easy enough to open and close. Next to the right eyepiece are to little light indicators, one tells you when the device is switched on and the other is a low battery indicator. I was unable to find out if this model was weather resistant, but the fact that it is not highlighted in their marketing would lead me to believe that they are not, which is something that you may consider if you need a device full wet weather night surveillance. In between the objective lenses is the built-in IR illuminator (Infrared illuminator) that enables you to use the binoculars whenever there is not enough ambient light to see clearly even even in complete darkness. It does this by emitting infrared light, which reflects from the viewed object and is then amplified by the tube in the same way as ambient light is. To turn it on there is a button on top of the body which is easily reachable whilst you are using the binoculars. The IR automatically turns off when the unit's main power is turned off. Under the device and on the right barrel is a built-in tripod mount that allows you to attach the SB50 to a tripod making extended observations much easier which is great for nighttime nature viewing and law enforcement. 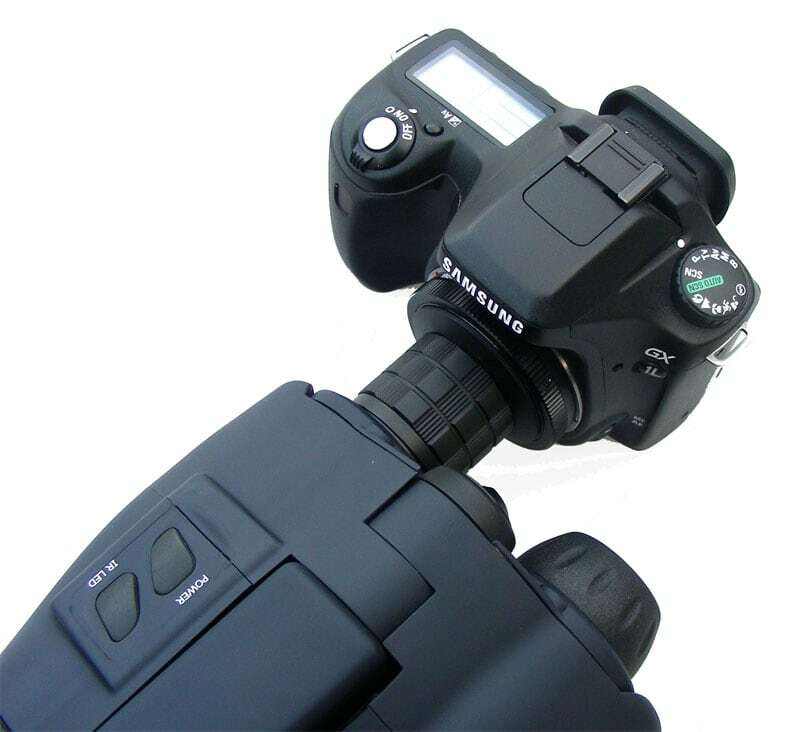 Because you can also attach an SLR camera to the binoculars (see below), attaching the whole setup to a tripod should also make for far better quality images. The eyecups seem to be made from a hard rubber/plastic that are comfortable against they eyes. They don't have side "wings" like what you find on the Luna LN-PB3 for example which really help to block out any side light. Each barrel on these night vision binoculars is focussed individually, by twisting the ends of them, which take about 3/4 of a turn to go from their near focus of 3m (10ft) to infinity. Because you have to do this for each lens, compared to a conventional central focusing binocular for example, this process is a little slow. In the world of night vision, a 5x magnification is really pretty powerful - many people who are used to using standard daytime binoculars may wonder why you can't find night vision binoculars with 8x or even 10x magnifications. The reason the magnification on night vision devices is usually much lower than of normal daylight binoculars is because to make higher magnifications, the objective lens elements need to be thicker. This means that they will transmit less light than thinner lenses. This is not as important during the day when there is plenty of light about, but at night time every little bit of light transmitted is vital. So to make night vision viable, the magnifications have to be lower, usually under 7x, thus preserving the best possible balance between image magnification and the light transmission. Therefore the powerful 5x magnification is ideal if you need or want to get up close up to the action ideal for security and surveillance and indeed night time wildlife observation. With optics, the larger the objective lens, the more light gathering potential and as you can imagine this is even more important in a night vision device. Therefore you would think that having giant objective lenses would be ideal, but huge objective lenses have the disadvantage of increasing the size and weight of the binoculars and large lenses are also far more expensive to make. With the 80mm objective lenses on these you have a device with really very good light gathering potential, but because of this they are not the lightest or smallest pair of night vision binoculars in the world. I also think the fact that these night vision binoculars have a powerful 5x magnification where larger magnifications mean thicker lenses which equals and less light transmission that the relatively large objective lenses were needed to maintain a nice bright image. Whatever available light there is (ambient light from stars, the moon and man made lights etc) reflects from the viewed object, passes through the objective lens of the LN-SB50 night vision binoculars and creates an image of that object on a photo cathode screen, which is located on the front of an Electronic Intensifier Tube inside them. When I turned it on for the first time, I was immediately impressed with the quietness of the high pitched whine that you often get on night vision equipment. Whist it is still audible, it is a lot quieter than most cheaper devices that I have used before. This is important if you will be observing easily spooked wildlife or for any surveillance where you wish to remain undetected. Looking through them for the first time, you can also clearly notice the difference between the 3x magnification of the Luna LN-PB3 that I also had with me and these with their more powerful 5x magnification. My testing was conducted on a night with some decent moonlight (Waxing gibbous, 70% of full) and a clear sky and so even though I live in an area without many street lights, for a night vision device there was plenty light about and so it should work really well... and it did! 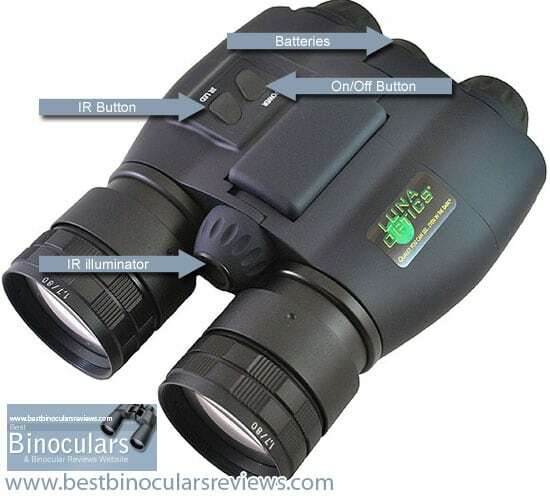 Their brightness and quality of the image is what I would describe as good to very good for a Gen 1 device and like the other Luna Optics binoculars that I have reviewed there were far less black dots that what I have seen in other lower quality night vision devices. Comparing the brightness and contrast between the LN-SB50 and the Luna Optics LN-PB3 that I also had with me, I would have to say though that even though these have larger objective lenses the image was brighter and had better contrast on the LN-PB3. The difference is not huge, but is noticeable and as with almost everything in optics, there are always compromises, and I guess this is it if you want a more powerful magnification. The built in IR illuminator works really well and lights up a pretty large area in front of you (which you can only see through the binoculars of course) - If you have never looked through a night vision device before, prepare to be amazed as you really can see in complete darkness! 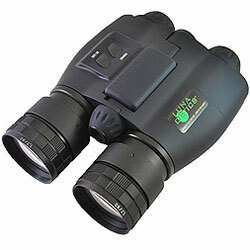 These night vision binoculars have a really long viewing distance of 325meters (1,060ft) which is excellent. 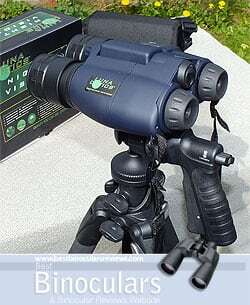 For comparison the ATN 5x90 Night Scout Night Vision Binoculars have what they call a detection range of 150 meters. The field of view for the Luna Optics SB50 is 9° or 158.4m at 1000m (474ft at 1000 yards), which considering that it has a powerful 5x magnification is pretty good and compares well to other similar powered night vision binoculars on the market. The minimum close focusing distance of only 3m (10ft) is pretty good for a night vision binocular and should be enough for most uses. One of the things that stands out with the stats above, is that you can easily see how by increasing the objective lens diameter, it increases the size and weight of the device as the heaviest also has the largest objective lenses. It is important to remember though that what it does not show you is how much brighter the image they produce is. You will also notice that by increasing the magnification, the field of view reduces. These night binoculars come with a large soft carry case that has plenty of room left over to store other things like a wallet or keys for example. They also come with a nylon neck strap that is adequate, but it would have been nicer if it was padded, especially when you take into consideration the weight of these binoculars. The metal lens caps screw onto the end of the objective lenses and therefore will not fall off accidentally. They have small pin holes in them so you can look through the binoculars during the day. You can easily attach you SLR camera to the LN-SB50 binoculars using the Luna Optics LN-CAS camera adapter and the a 'T' mount adapter for your particular SLR camera, which effectively converts the binocular into a night vision lens for your camera. To mount it, all you have to do is remove the eyepiece on the LN-SB50 and screw in the LN-CAS adapter. This then attaches to your 'T' mount adapter and then onto your camera. Overall I liked these LN-SB50 night binoculars, like the LN-PB3, I especially like the look of them and being able to adjust the inter-pupillary distance, which you can't on the LN-PB3 is great. It works really well, the image produced is bright with a reasonable amount of contrast. Sure you can get brighter night vision binoculars, like Luna Optics own LN-PB3, but remember they are more expensive and have a lower magnification. Weak points? I guess if you are used to normal binoculars, you would say that a weakness is the time it can take to focus the binoculars as you have to adjust each lens separately. For the most part if you are looking at objects in the distance, you should not have to do this too often as the focus would be just set to infinity. But if you are constantly changing from looking at something near to you and then to something in the distance, having to adjust each lens could get a little annoying. Being very critical, I would also liked to have had a padded neck strap, to make them more comfortable as they are a fairly heavy pair of optics. So if you are looking for a powerful, yet relatively in-expensive 1st Generation night vision binocular that is ideal for home security, surveylance or night time wildlife observation and you are not too worried about weight and portability, then these are ideal. Because of their size and weight, for most people they would probably not be ideal to take on safari, rather choose the Luna Optics LN-PB3, or if you really want to save space, weight.. and money, a night vision monocular like the Luna Optics SM50 is ideal as it also has a powerful 5x magnification.